Sanjay is Chief Executive Officer and Managing Director of Tejas Networks, a leading optical networking product company from India. Mr. Nayak is a technologist with over 20 years of industry experience in India as well as the USA. 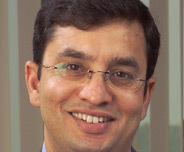 Prior to Tejas, he held senior management position in globally leading electronic design automation companies including Synopsys (where he was the Managing Director of Synopsys-India) and Cadence Design Systems. Sanjay holds a Master’s in Electrical and Computer Engineering from North Carolina State University, Raleigh and a Bachelor’s in Electronics and Communication Engineering from Birla Institute of Technology, Mesra.